When we need an exotic centerpiece we bring in one of our large Blue Ribbon tropicals to save the day. 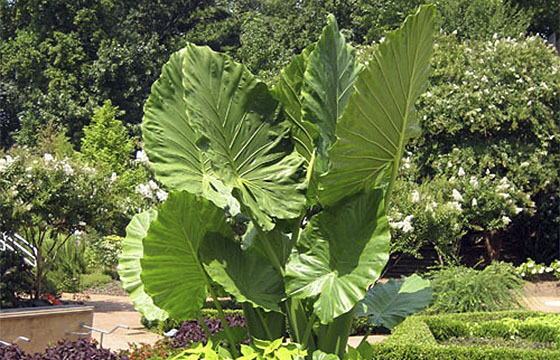 Their enormous, striking leaves and commanding presence turn an ordinary garden into a virtual vacationland. If only we could extend their season of interest so we could enjoy some of that warm, relaxed vibe during the cooler months of the year. Enter our new cultivar for 2018, ‘Borneo King’. 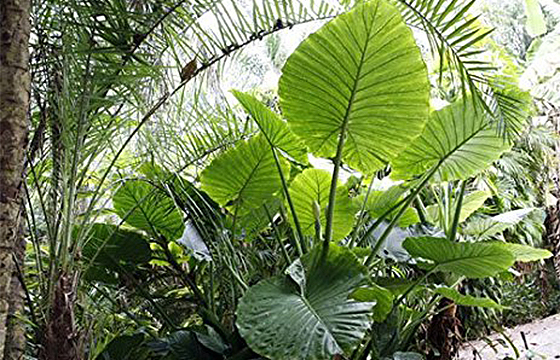 This upright green Alocasia has the vigor and hardiness of another tropical favorite, ‘Odora’, but reaches the same impressive size here in the North that ‘Borneo Giant’ does in far southern states. 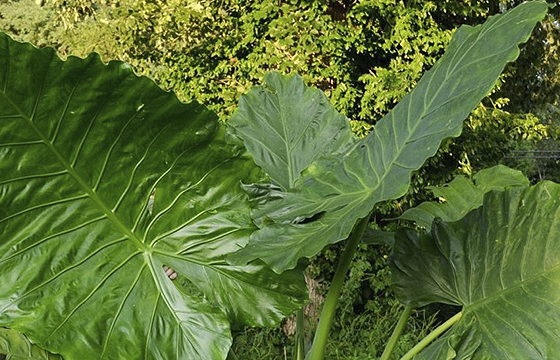 In that way you could consider this plant a superhero of sorts—like the Incredible Hulk: it’s green, it’s huge, and it reaches massive proportions almost immediately. In the short span of a season small starter-sized plants can grow 4–8 feet. ‘Borneo King’ can attain an even larger size the following season. 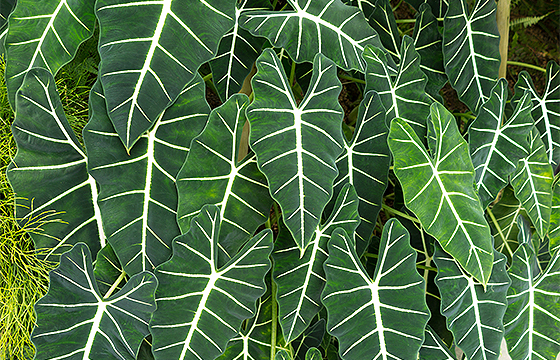 These beautifully rippled leaves are oversized, too, at about 3–4 feet long and wide. 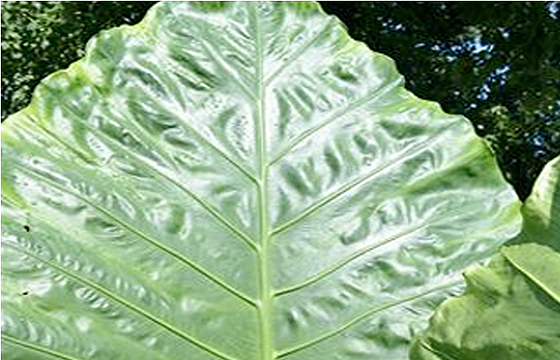 As the plant matures the rippled effect becomes more pronounced, and the leaves can reach up to 4–5 feet. A large trunk forms with age as well. ‘Borneo King’ works best in full to part sun and rich, organic soil. Keep in mind that this plant needs regular watering and requires good drainage. You’ll get the most growth in a location that’s protected from the wind. 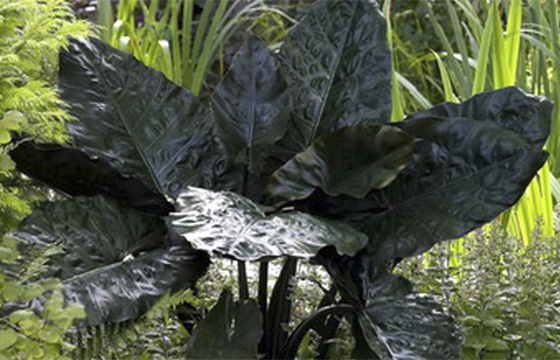 Another Alocasia with striking foliage is returning for 2018 as well: plumbae ‘Nigra’. You probably remember the dramatic fronds on this variety—they’re deep green-to-purple but the color appears almost black, especially in the shade. 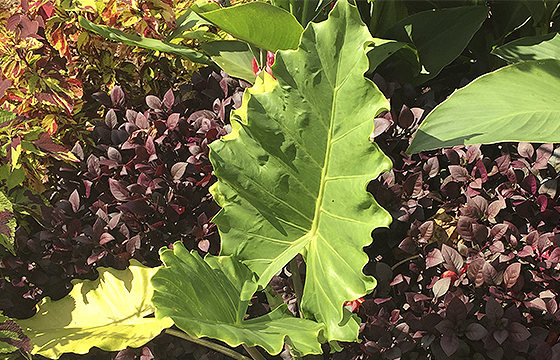 Leaves measure 18–24 inches long and are held on strong, dark purple stems. A slick metallic finish and light puckering heighten the exotic effect.